Call (212) 645-8151 to schedule a Consultation with a Spinal Decompression specialist in New York. I just received my completed magazette about spinal decompression. This a a complete informative description of all Spinal disc related problems and treatment methods. If you or someone you know suffers from Disc herniation, Sciatica, Facet Syndrome or Failed Back Surgery please email me and i will send out the brand new packet of information that contains studies and pre and post MRI's. In the email please include full mailing addresses. My latest patient had a spinal laminectomy 3 years ago and recently hasn't been able to out her shoes on due to a flair up and after confirming presence of a herniated disc one level up from where the previous surgery was preformed I started her with Spinal Decompression therapy on the DRX 9000. I was impressed with her outcome because after the first visit she had a 10% reduction in pain and an increase in her ROM. 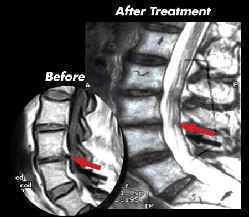 New York spinal disc decompression treatment.